Monday we had a heavy downpour, unbelievably it is the first rain we have had since leaving three months ago (sorry UK friends I know you’ve just had a very wet day), it was quite a novelty. As the squall moved in, high winds swirled around the bay causing chaos as the anchor ballet fell to bits. Every boat in the crowded anchorage had a mind of its own and a wet half hour was spent fending off. The catamaran beside us was affected particularly badly , the poor guys onboard working hard not to hit us or the cliffs close on their other side. As we haven’t been in port for a while Raya was pleased for the fresh water soaking and in between guarding our flanks we gave her a good wash down. I am trying to build in a bit more excercise to my days, besides the casual swim to the beach or snorkeling, at anchor I am swimming circuits around the boat. This eliminates the risk from passing motorized mad people and depending on conditions, gives me a gentle or if it’s rough or the boat is swinging, a good work out. I am also doing a half hour of palates a few times a week. How often depends on it being calm enough to make it possible and quiet enough for me to feel comfortable waving my legs about on the very public bows of the boat. Wednesday morning was perfect, satin smooth sea and just a few boats spread well out in the large anchorage. As I looked about during my stretches, it occurred to me how the view from my mat, normally the sweaty reflection of myself and my classmates in the mirror of the fitness studio, has improved some what. 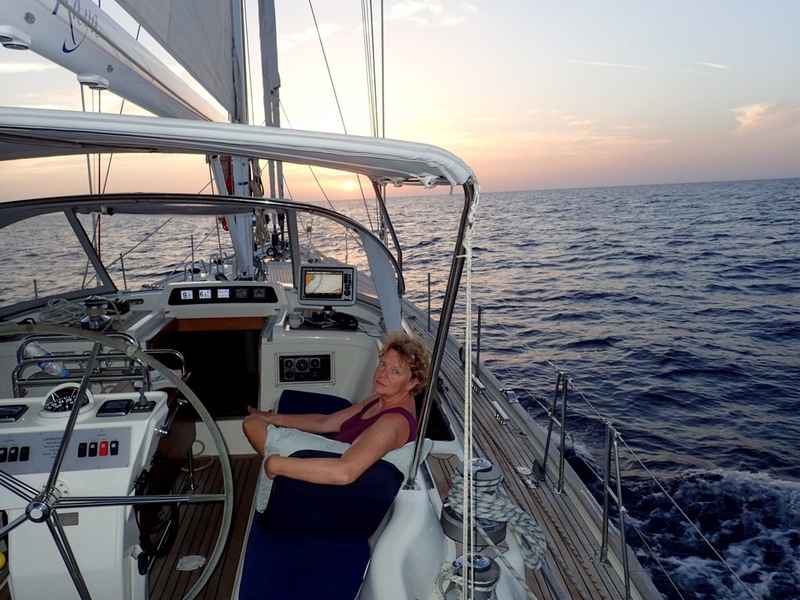 After we dropped Eric and Roz Saturday we spent a couple of days hopping between bays along the south coast of Menorca we had a bit of wind and it was great to be sailing more than motoring. There were plenty of very beautiful and unspoilt coves that I’m sure are delightful out of season but in August they were heaving with yachts, it was just too crowded for us and so after one more night we moved on. 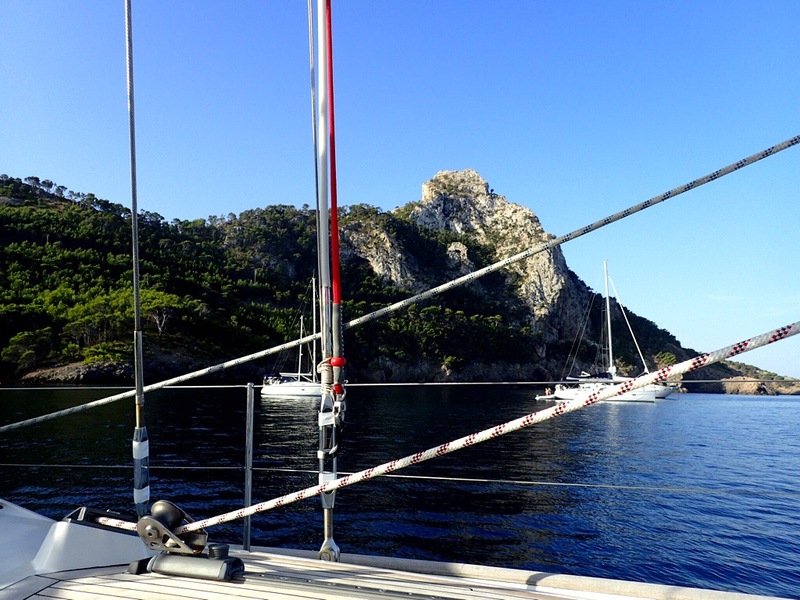 Tuesday evening found us back in Cala Pinar – shaggy eagle bay, on the very northern tip of Mallorca, a convenient stopping point before our sail to the Spanish mainland the next day. It’s now Thursday afternoon and we arrived early this morning in Sant Carles de la Rapita on the coast of mainland Spain where Raya will be coming out of the water for a couple of days. We are having three coats of anti-foul applied to the hull, a first step in the preparations for the bigger adventures to come. Hopefully it will keep us weed and banicle free until we reach New Zealand in just over a years time. Stella Maris our refit guys from the UK have a partnership here and have negotiated us a very good price, so it seemed worth the detour and we plan to take advantage of our location for a few non-boat days with a trip to Barcelona. The twenty hour crossing from Mallorca, started with zero wind, a bit annoying as we had planned the crossing a day or two early to take advantage of the forecasted perfect sailing conditions. However as the sunset and just as we finished being scathing of meteorologists weather forecasting abilities the wind suddenly picked up and we were soon flying along in a F4 on a beam reach. It was a very dark night and as I came on watch around 1am I felt completely disorientated, there was no moon and cloud obscured most of the stars and disappointingly the promised meteor shower. It took the lights of another boat in the distance, about an hour in, before I really felt comfortable that I was being an effective look out. Rick still has yet to master the art of sleeping during nights at sea, the weight of responsibility lying heavy on his shoulders, not to mention the heat below making for very sweaty conditions. So today is a rest day, tomorrow back to reality and top of the agenda is the cleaning of our rather smelly grey tanks, the tanks through which our waste water from the showers etc runs, delightful. This entry was posted in Getting Ready, Passage making, Spain by Roz. Bookmark the permalink. Enjoying your posts, Roz – glad all is going well! so much enjoy following your adventures and hope you enjoy Barcelona – looking forward to seeing you and proper catch up when you are back in the UK. Love the photos as well. Legs in the air – what the heck!